Pink Lemonade: Special Birthday Party Giveaway! Today is my Birthday! Yes, as my friend used to tell me I am now officially as "Old as Dirt". But what the hey - I'm still going to celebrate! I'm throwing myself a little Birthday Party today and to make things really fun, our friends at momAgenda have given us an awesome School Years book for the winner of our very special giveaway. 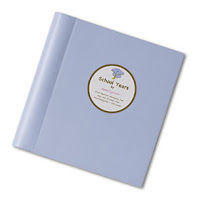 School Years by momAgenda is a simple, effective way to keep track of milestones in your child’s school career, from Pre-K through 12th grade. To enter our contest, pop on over to momAgenda and check out all the great products they have to simplify your life. Then come back and let me know what your favorite product is and how it could help you make life run more smoothly. My choice is the 2008-2009 Faux Crocodile momAgenda Desktop. Lovely in pink. Thanks. I would love the 2008-2009 momAgenda Kitchen Folio. I could so use this for a place to put all the grandkids papers and to keep my kitchen organized. Thank you! First off...HAPPY BIRTHDAY!!! I **love** birthdays. A day just to celebrate YOU! Woo Hoo! I like the lovely Raspberry 2008-2009 momAgenda Personal Portfolio because I am fairly disorganized, but I try! thank you and have a very happy birthday! Happy birthday!! And I also like the kitchen folio! Although I'm glad you're giving the school one away since my son just started preschool! I like the momAgenda All n One. I like the momAgenda All In One Folio. It has everything I would need to keep my life organized! Thanks! The Chores Pad!! I love it. My kids are always getting out of their chores because I have no real system in place. I have the Kitchen Folio and it is really handy. I'd love to try the original MomAgenda desktop planner someday, too. The mini daily. I could carry it in my pocket. I think the Raspberry 2008-2009 momAgenda Personal Folio would really come in handy! Love the kitchen folio!! and HAPPY BIRTHDAY!! thanks so much. Happy Birthday to you!! I think the Chores Pad looks interesting and would help teach my family some organization! I love the chores pad. for me, the wall calendar would be the most useful so I can see at a glance appointments and important dates. I like the momAgenda Wall Calendar 2008-2009. We are big calendar users here. This one has extra space for notes and a seperate sheet for important dates. All In One Folio because I'm so disorganized. Happy birthday. Hey, that's the same age I am (old as dirt). I could use the momAgenda All-in-One. Thanks and Happy Birthday. Im loving the momAgenda Desk Pads! I could use some of those. I love the the 2008-2009 momAgenda Kitchen Folio! I like the kitchen folio. Thank you. 2008-2009 Faux Crocodile momAgenda Desktop in deep-ocean is my favorite product from momAgenda and I know it could make my life run much more smoothly by helping me keep up with all my appointments and my grandchildren's sports games! We could definitely use the Chores Pad in our house, but I'm very excited at the possbility of winning the School Folio. I'm drowning in school papers and awards and information! I could really use some help in getting organized and Happy Birthday. Happy Birthday! i do definately need help to be organized. I like the Mom Agenda Wall Calendar as that is the best way for me to organize to put what I need to do every day on the calendar and place it where I get my tea cup out in the morning. I would like the momAgenda All-in-One. I so love the the 2008-2009 momAgenda Kitchen Folio! Brilliant! I love the momAgenda Kitchen Folio! I think it would help me organize my recipes.